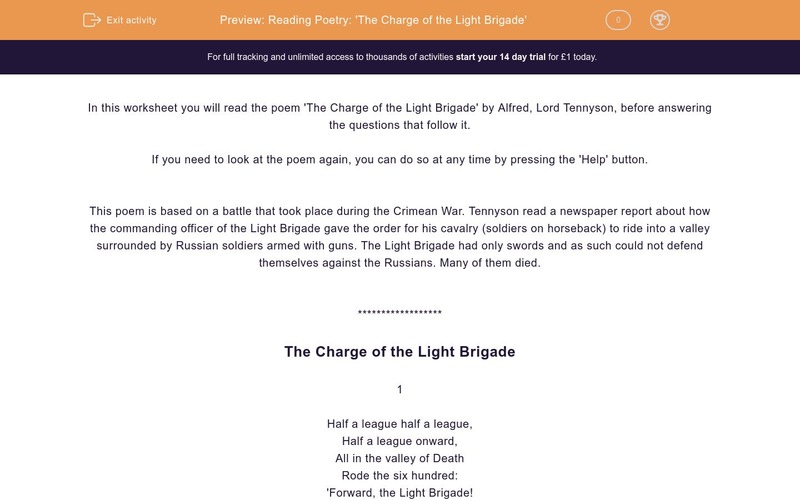 In this worksheet, students read the poem 'The Charge of the Light Brigade' by Alfred, Lord Tennyson. Then they answer some questions to develop their understanding of the poet's use of language, form and structure. In this worksheet you will read the poem 'The Charge of the Light Brigade' by Alfred, Lord Tennyson, before answering the questions that follow it. If you need to look at the poem again, you can do so at any time by pressing the 'Help' button. This poem is based on a battle that took place during the Crimean War. Tennyson read a newspaper report about how the commanding officer of the Light Brigade gave the order for his cavalry (soldiers on horseback) to ride into a valley surrounded by Russian soldiers armed with guns. The Light Brigade had only swords and as such could not defend themselves against the Russians. Many of them died. Reread stanza 1. What metaphor taken from the Bible is used in this stanza to suggest that the soldiers are not going to survive this battle? Reread stanza 2. What command from the commanding officer is repeated from the first stanza? Which word tells the reader that this command was a mistake? Reread stanza 3 and match the following quotations with their explanations. Hover your mouse over the boxes to read the explanations in full. Reread stanza 4. Which phrases does Tennyson use to remind the reader that the cavalry were defenceless against the Russians because they only had swords? Choose as many answers as you think are correct. Reread stanza 5. This stanza begins in the same way as stanza 3 but then there is a change. Complete the quotation in the box below that shows that the soldiers are losing the battle: You should write the quotation out in full. Reread the final stanza. Select the words which sum up how Tennyson wants the cavalry to all be remembered as heroes. How is this poem narrated to make it sound like a story? In this poem Tennyson creates a very strong rhythm which is present throughout the poem. What are the three effects of this? Reread the final lines of each stanza. What is the effect of the repetition of the words 'six hundred'? Thinking about the poem as a whole, match the feelings and attitudes of the poet with the explanations. The command given by the Commanding Officer is "Forward the Light Brigade". 1. "Cannon to right of them, Cannon to left of them, Cannon behind them". The repetition emphasises that the soldiers are surrounded by enemy weapons and have little chance of surviving. 2. "Volley'd and thunder'd". Tennyson uses powerful verbs to suggest the power of the cannons. 3. "shot and shell". The use of alliteration emphasises the sense of ammunition flying at the soldiers. 4. "Boldly they rode and well". Tennyson admires the bravery of the soldiers shown through the words 'Boldly' and 'well'. 5 "Into the jaws of Death, Into the mouth of Hell". Tennyson uses imagery to personify death and hell, suggesting that the soldiers cannot escape it. "Flash'd all their sabres bare"
"Reel'd from the sabre stroke"
They all contain the word 'sabre', meaning sword. The quotation that changes the tone of this stanza is: "While horse and hero fell". It shows how the Cavalry are starting to lose the battle. The words that show the soldiers to be heroes are 'glory', 'honour' and 'noble'. The poem is narrated in the third person which makes it sound like a story, reflecting the fact that the poet used a newspaper report as his basis for the poem. 1. To mirror the sound of the horses galloping into battle. 2. To suggest the cavalry moving forward at a fast pace. 3. To suggest the energy of the battle. The repetition of the words 'six hundred' emphasises the fact that the death of all these soldiers is inevitable and reinforces the sense of the scale of the battle. 1. Respect: Tennyson clearly admires the bravery of the soldiers in the face of adversity knowing their deaths were imminent. 2. Horror: Tennyson tried to communicate how terrifying and violent this battle was. 3. Shock: Tennyson seems to express disbelief at the stupidity of the commanding officer's order which sent so many soldiers to their death.